“This reminds me of the Pirates of the Caribbean ride at Disney,” said Patricia, one of my traveling companions, as we entered the dungeon part of the Exchange and Provost Dungeon Museum. She was right. There was a damp feeling and a musty odor, and groupings of mannequins dressed as 18th century pirates. Sadly, there wasn’t any Johnny Depp, yo ho ho-ing, or cute scruffy dog holding keys out of the reach of jailed pirates. The damp and must was from water seeping from the ground and collecting in subfloor pits (“We have to pump it out about twice a week,” said the guide). And the pirates were far less sophisticated and animated than their Disney brethren — no singing or dancing from these guys (photo credit to Patricia). The building originally on the site was called the “Court of Guard” (circa 1680), a combination of garrison and jail. 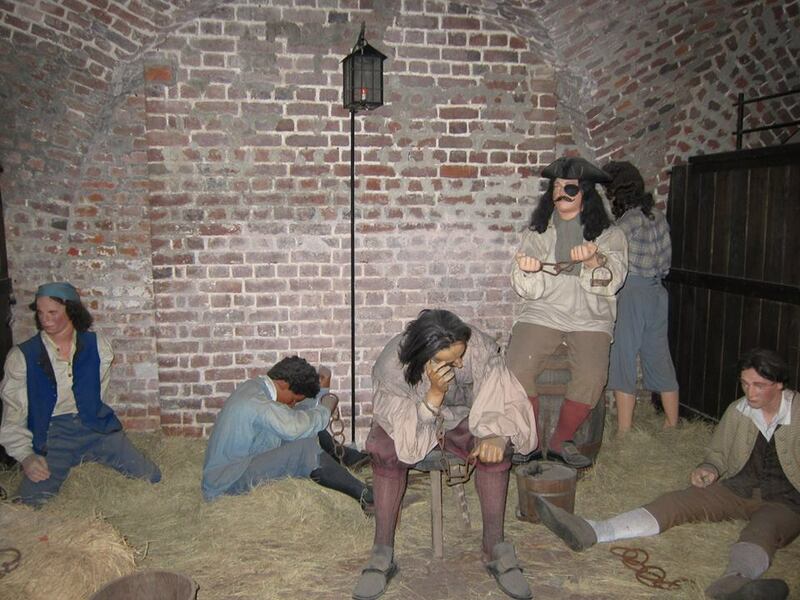 It was there that Charleston’s favorite pirate, Stede Bonnet, was imprisoned in the weeks before his 1718 hanging. Bonnet was a particularly inept pirate who captured Charleston’s imagination because he was born to a reasonably wealthy, middling plantation family. He was such a bad pirate that it only took a year and a half from the time he started to the time he was hung, with almost a year of that spent not-pirating. “What made him turn to pirating?” asked someone in our tour group. “A midlife crisis, perhaps?” said the guide. Bonnet started piracy at the age of 28, which in the early 18th century was, I suppose, middle-aged. “Oh yes,” she said. “And pirating sounds like a good option.” I can so see Kellyn as a pirate. She is, after all, a museum registrar by day and on the DC roller derby team at night – both excellent training for piracy. The Court of Guard was eventually torn down and the Exchange built in its place. 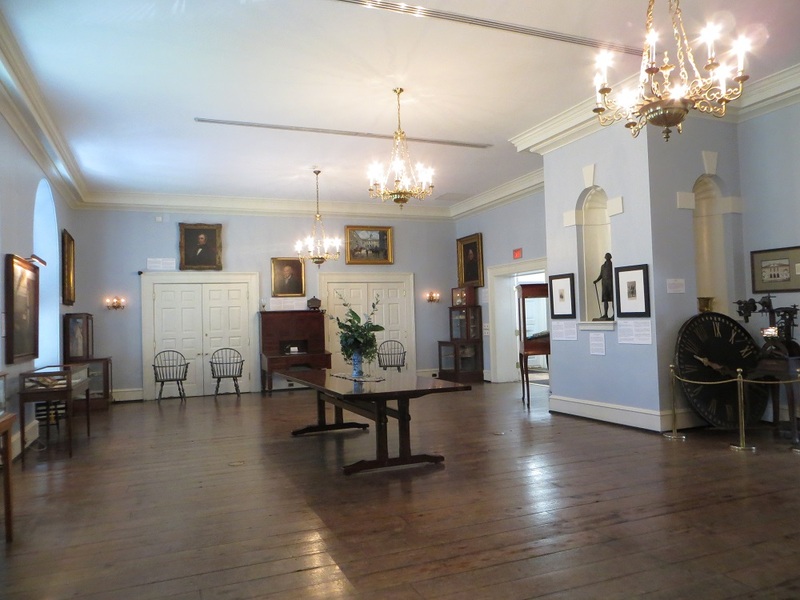 The Exchange cellar, built as storage for shipped goods, was used as a prison by the British during their occupation of Charleston between 1780 and 1782. Edward Rutledge, Arthur Middleton and Thomas Heyward, Jr., signers of the Declaration of Independence all, were held there before being sent to St. Augustine, Florida, to be imprisoned for the rest of the war. 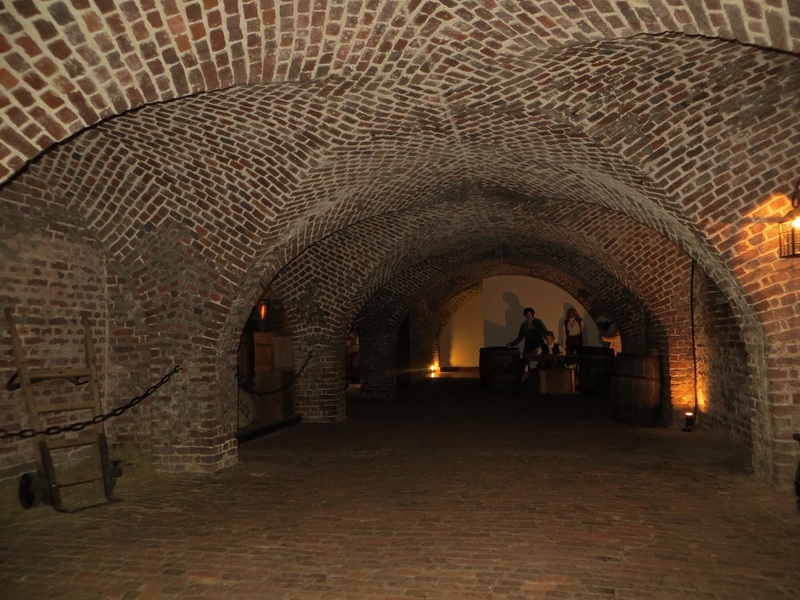 The cellar is comprised of about 1.5 million bricks, handmade by enslaved Africans. There are no individual cells, just one large room, so everyone — wealthy political prisoners and career criminals — were all thrown together. It was not, said the tour guide, a happy situation for the rare woman (usually accused of being a spy) who found herself there. The Exchange and Provost Dungeon building is now owned by the local chapter of the Daughters of the American Revolution and on the two main floors above the dungeon, the museum showcases its elegant Georgian rooms with displays of various early American and DAR artifacts. A bit of a snooze after the kitschy dungeon display. Gallery | This entry was posted in South Carolina and tagged Charleston, Exchange and Provost Dungeon, pirates, Stede Bonnet. Bookmark the permalink. I missed this on my trip to Charleston, I will have to go back. Who doesn’t love a good dungeon? When I was in London, I passed the Clink Prison Museum, but it looked a little gruesome. The Provost Dungeon seems much tamer, I like the brick vaults! It was a little cheesy, but great fun. Definitely would recommend it. I enjoyed this building on our trip to Charleston. I liked hearing about how they walled up their gunpowder in the dungeon, and the British never knew it was there the whole time they occupied the building. Fascinating place! I know — they were sitting on all that gunpowder and they didn’t know it. Looks like my sort of museum! The structure was beautiful — all those handmade bricks. And the story was fun. What’s not to like?